Make sure you read all the way to the bottom! There are times that I feel like one of the only guys who remembers the Shopsmith Mark I (Mark One). Due to its name it is often thought to be one of the predecessors of the Mark V, but it was actually an effort in 1987(ish) to offer an entry level tool that folks could buy and later trade-up to a full fledged Mark V.
I had one for several years that I modified for use as a stationary lathe, and am fairly confident that one of my old coworkers may still have his. I even had an in-store flier and manual for the Mark I, which I need to try to unearth in the myriad of boxes from our most recent move. So what’s so different about the Mark I? It had a modern Mark V headstock, a 510 carriage, fence, guards, etc and short way tubes that were about half the normal Mark V length. There was no base but instead it had two identical cast aluminum bench ends. As such the Mark I could not be used as a vertical drill press. Just like the early 10er the new Mark I owner had to build a base for his new tool before he could use it. The instructions were quite clear that the base should not be built using the baseless Mark I. This always med me chuckle. There were two vertical holes in each of the base ends for mounting SPTs, but they were locked in place with setscrews rather than the knurled locks that are featured on the Mark V.
The deal was you would buy the base model and upgrade it as your needs changed or your cash flow improved. One upgrade gave you the Mark V legs and bench ends; another included lathe parts and a third upgrade provided you with the drill press parts and the full-length bench and way tubes. In all if you purchased all the upgrades you would still come within $100 of the full price of a Mark V. Not a bad deal if cash was tight or if you didn’t need all of the features of the Mark V.
The Mark I was test marketed in the Indianapolis and LA Shopsmith retail stores, as well as the factory showroom in Dayton, Ohio where I was working at the time. I know of two that were sold and almost immediately returned in exchange for a Mark V. One of these was sold by me and the other by a buddy of mine in the Indianapolis store. The picture at right was taken in the shop of a buddy who got his hands on a Shopsmith Mark I. Because he already had a couple Mark V's he cleverly mounted the Mark I on the wall for use as a dedicated drill press. I didn't ask his permission to post his name, but I do want to give credit to my buddy Tom N.
You can see that Tom mounted the model 510 legs on the table to prevent any table deflection in heavy mortising. Thanks to my bride and her wicked organizational skills, I was able to go right to this picture. I found a few other interesting ones that I'll share with you some day including a cool idea for making a horizontal router table for the Mark V.
OK, for those of you who thought that I was insane when I posted the photo of the Mark I that's mounted on the wall of my friend's shop; thinking that I was making it up: Here's final proof. 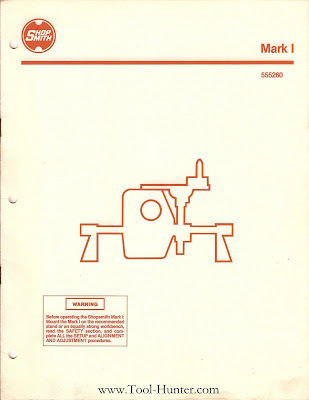 This is the cover of the Shopsmith Mark 1 (555260) owner's manual from 1987. As I mentioned before, the funny thing about this manual is the warning on page 4 that states: "Use only hand tools or other power tools to make the stand. Do NOT use the Mark I". 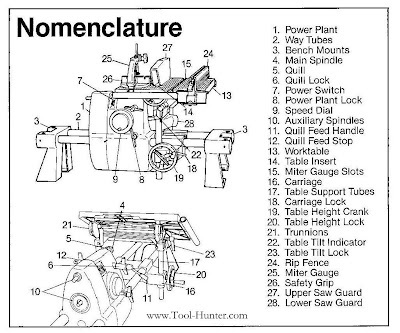 The last pic is the Nomenclature of the Mark I from the manual. The only difference between this and the Mark V is part #3. One very interesting thing to me about this is it shows the "C" headstock, which has a removable plastic key-switch a bit left of the center of the Speed-Dial. Why is this odd? Because the "C" Headstock wasn't introduced until 1991. I remember seeing prototypes of this headstock around the Quality lab years before it's introduction, but it's weird that Shopsmith Inc. showed it here. I may have said this before, but to my knowledge there were only two of these tools sold, and one of those two was returned in exchange for a Mark V. I wonder were the remaining Mark I is.